Disclosure: This post is sponsored by HomeRight. All opinions are my own. When we purchased our home (which was a foreclosure) in late January of this year, we were pleasantly surprised to find that a brand new deck had recently been added. We knew that one of our big projects this year would be staining and sealing it, and we hoped to get that done in the spring before the heat of summer took over. Then I got pregnant and sick, and our project list grew so long that the poor deck kept getting pushed down on the list. Summer came along and the scorching Atlanta heat prevented us from working on it as early as we would have liked, so now it’s October and here we are. But now we are ready! 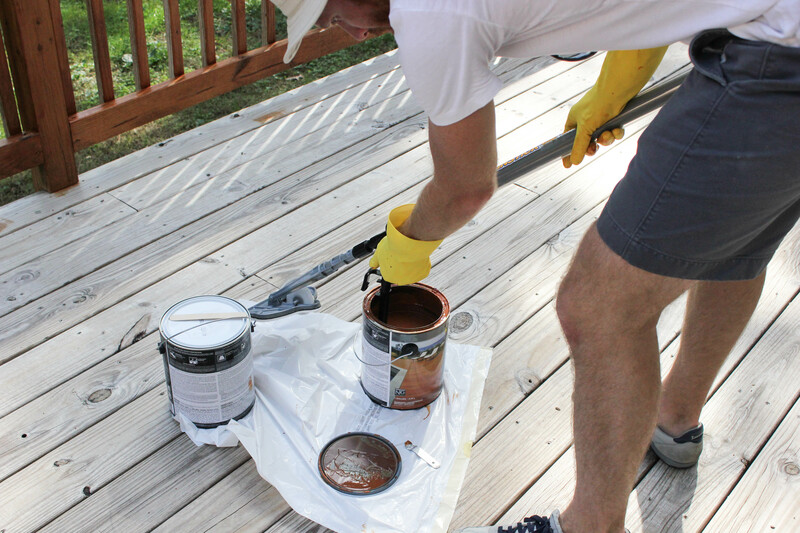 Before we could really make the deck an inviting, attractive place to hang out, we had to stain and seal it. And by “we,” I mean Chris. (Just another pregnancy perk.) 😉 Luckily he had some help from HomeRight. (Read on for more about that.) 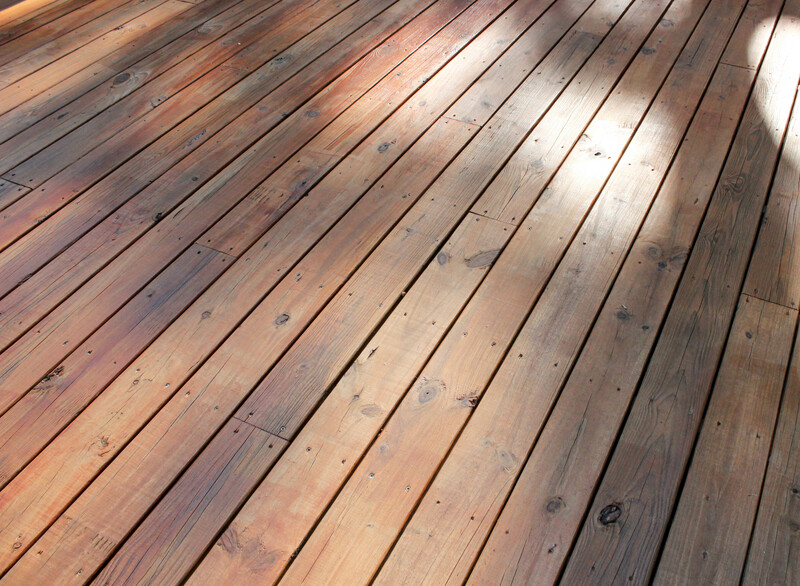 Now, let’s walk through the process of how to stain a deck. The first step is to prep the deck. 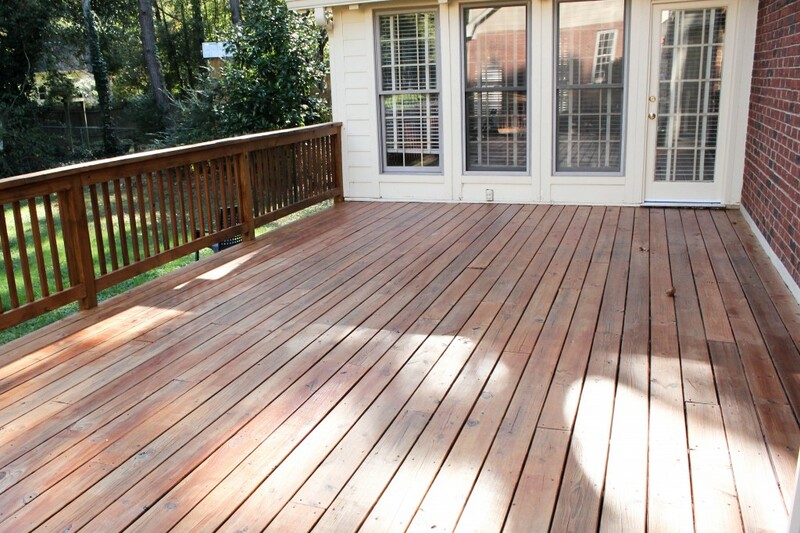 Our deck is made from pretreated wood, but it has weathered long enough to be stained at this point. 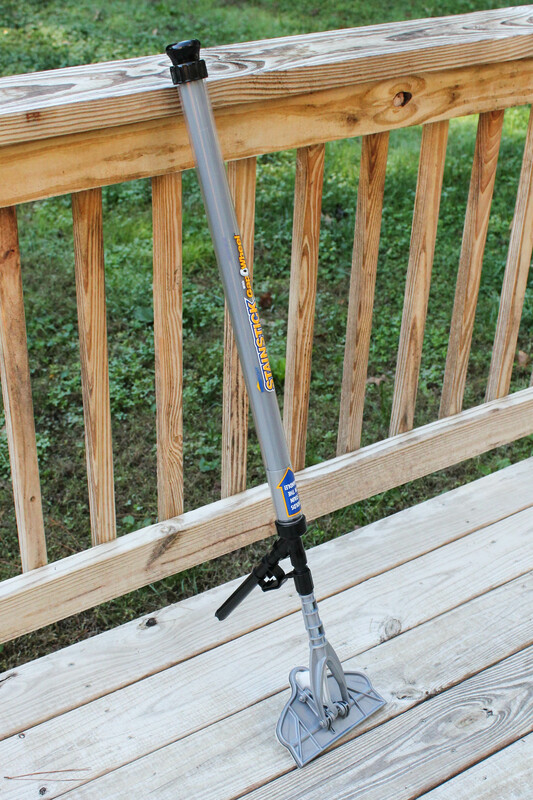 Use a deck cleaner to scrub all of the dirt, residue, mildew, etc. off of the surface of the wood. We used Thompson’s Deck Cleaner. The price was very reasonable and it was easy to use. Next, he scrubbed it with a broom and rinsed it really well with the hose making sure to wash away all of the residue. The instructions recommend waiting 3 days before staining. Overall, the cleaning portion was easy and not overly time consuming. We definitely recommend the tank sprayer to apply the cleaner though. It saved a lot of time. 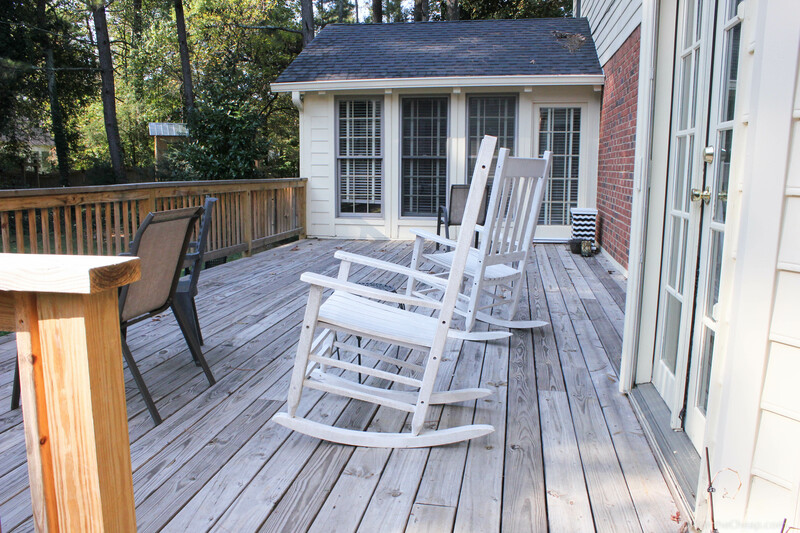 If your deck has been stained previously and is chipping or peeling, you may need to sand it down as part of the preparation process. After we waited 3 days, which actually turned into a week due to some unexpected rain, and the deck was thoroughly dry, it was time to stain. Now, I’m not going to sugar coat this. 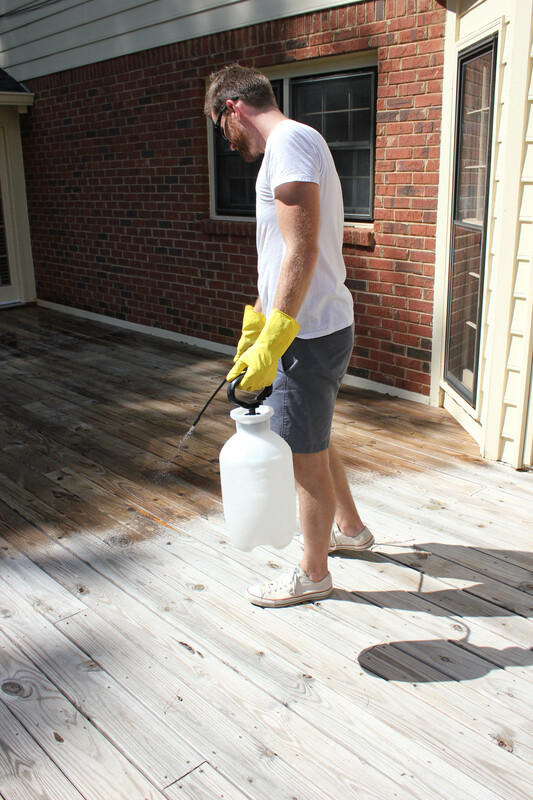 Staining a deck is time consuming. We have a pretty large deck, so for this size it took several hours for just one coat. The railings were the most time consuming — the main surface of the deck didn’t take too long. Although the stain we used recommended two thin coats, we went with one since it ended up going on a little thick and providing good coverage, plus the first coat itself took a ridiculous number of hours thanks to the fact that we have so many railing balusters. We may end up adding a second coat to the main surface of the deck. 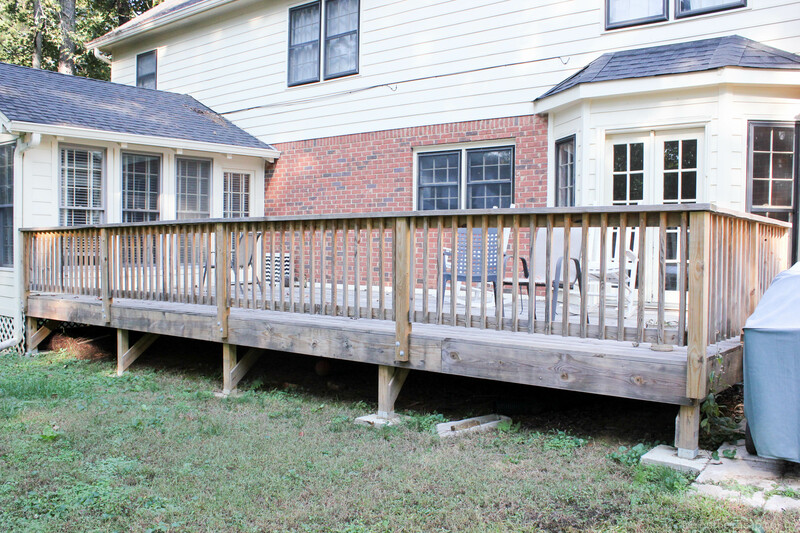 If you don’t have a lot of railing to cover, then this project won’t take you nearly as long. We may end up adding a second coat, but we haven’t decided yet. This thing is awesome! It allows the stain to glide on evenly, saves time since you don’t have to brush the entire surface by hand, and has a wheel built in to get the stain into the gaps between boards. 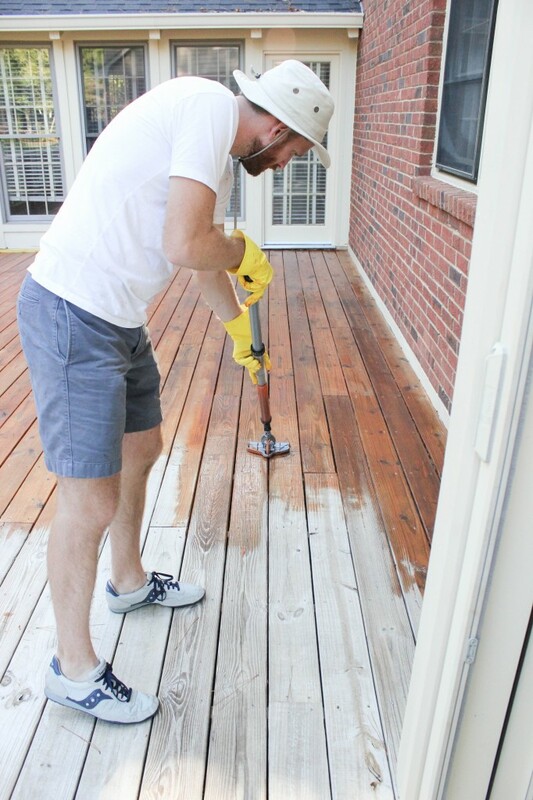 Since staining a deck is generally not a super quick process, I know Chris was thankful for this time-saving tool. It took him a long time to stain the whole deck — many hours — so I can’t imagine how much longer it would have taken him without the StainStick. Plus, it saved his back since he didn’t have to bend over the whole time painting each board. You can load the stick with stain and it will dispense it onto the staining pad as you push the handle. 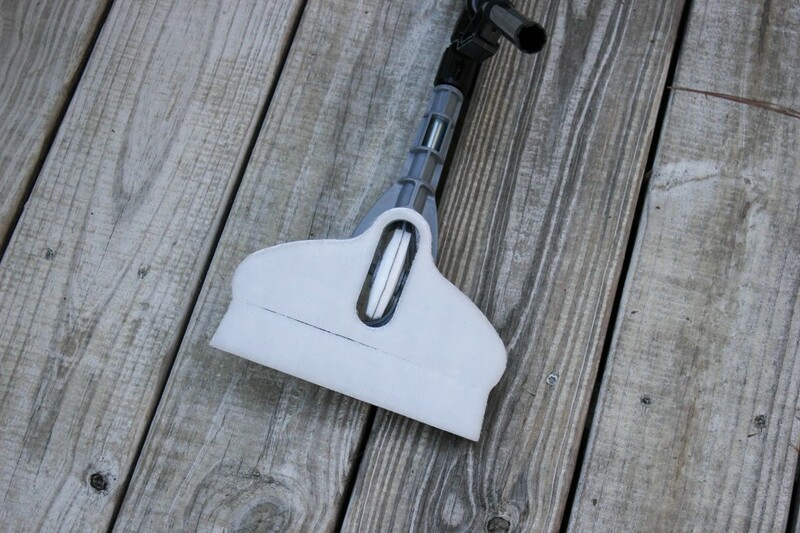 To load the stick with stain, you can attach it to the fill tube which clips directly onto your can of stain and then just twist the handle to draw the stain into the stick. We decided to go with a transparent stain in a Natural Cedar Tone. We wanted as much of the wood grain to show through as possible, but we wanted a hint of color for added protection and also to make it look a little nicer. 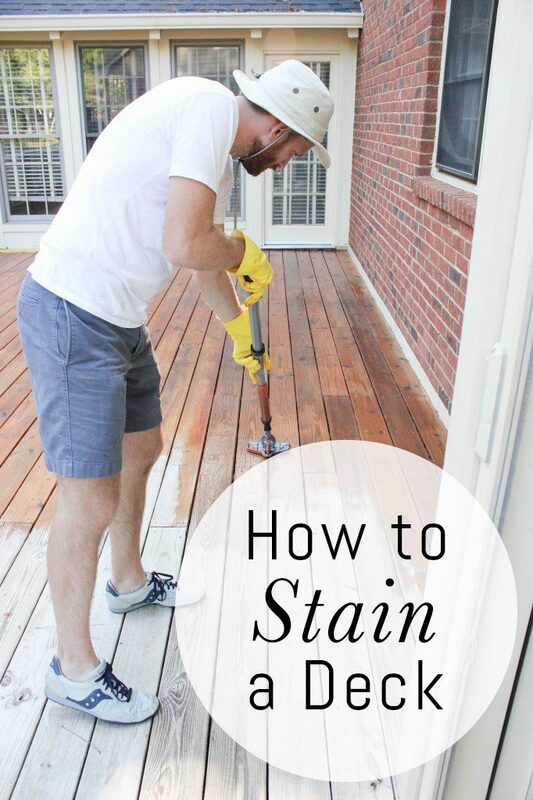 Now you know how to stain a deck! For more information about HomeRight and their awesome products, you can connect with them on Facebook, Twitter, Pinterest and Instagram. Now, we just need to arrange some furniture, add some flowers and make this deck look like an inviting place to hang out! If you’re new here, feel free to explore my Project Gallery! Thank you Kadie! Yes, the Stain Stick definitely made the job easier! It’s amazing the difference stain makes! Looks fab! That looks awesome! I am getting ready to stain my fence and my deck and I really like the stain you used. Do you mind telling me the brand please? Thank you! We used Behr semi-transparent stain in a Natural Cedar tone. It’s available at The Home Depot. What stain color did you used? Thanks, Lurline! We used Behr Transparent stain in Cedar NaturalTone. Saw your tutorial on staining and sealing a deck! Could you or would you tell the brand of stain,sealer used and if it was oil based? acrylic water based? I am looking to do our deck(new) next year and would like something that would prevent slivers & splintering! Thanks again for the great turorial. Thanks Joe! We used BEHR Preumium Cedar NaturalTone Transparent Weatherproofing Wood Finish. It’s an acrylic formula, and it’s held up pretty well for the past couple of years with the exception of some peeling underneath the back door mat. Good luck! Thanks again,,,in future I will read all the comments first!! !